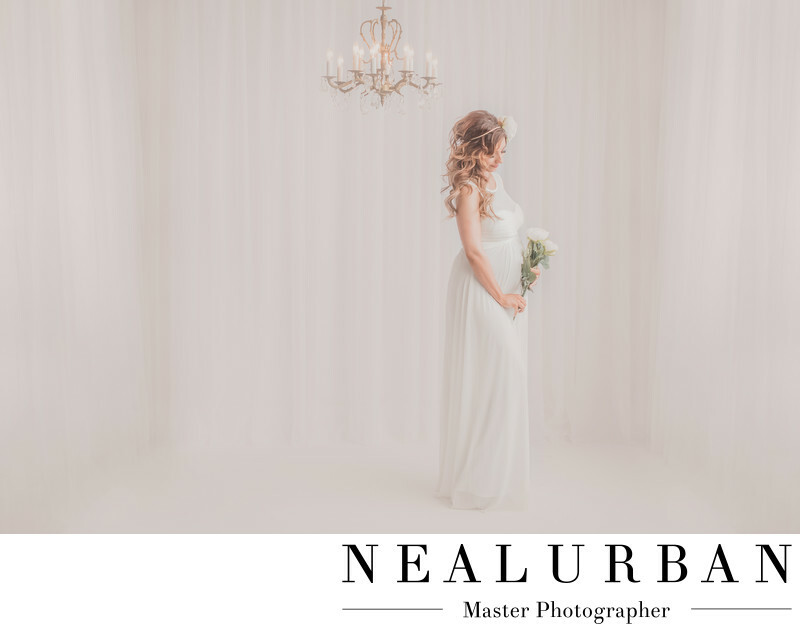 A lot of people think Neal Urban Studio only takes wedding photos. We do not! We take every and anything! Just like you see here! The stunning Sondra! Her maternity photos were amazing! We did these in studio. We created a light and airy setting for her and baby LOVE (those are her initials). Super cute! Sondra wore the perfect flowy style maternity dress for her shoot. She had a friend make her flower head piece. She brought the added bouquet for a feminine touch! We really wanted this shoot to be simple! For the backdrop we hung tons of sheer white drapery. You have to love Joanne Fabrics when it comes to needing yards and yards of material! When we saw Sondra's dress we knew we could bring in our antique chandelier to make the photo even better. It added just enough warm lighting to the image. We have giant windows in our Studio, so the light was pouring in. Sondra was such a glowing mommy to be! We did add some extra light to the back of her. We needed to fill in with that to keep everything consistent for the look we were going for. We try to do everything in camera, so there is not a lot of post work or photoshopping. The only editing done here, was making the image have a vintage or antique finish! Congrats to this momma! Location: 2495 Main St, Buffalo, NY 14214.